The summer I awoke from my childhood coma was the season of The Music Man in America. My switched-on awareness of the outside world, much tainted by Hlwd and TV, was expanding into new visceral experiences: the greening of the once barren landscape in Canoga Park; the sacred desert air of Palm Springs; the cool exoticism of San Francisco. It was in the latter that I first learned of The Music Man; the title and jolly cartoon-parade poster plastered outside the Coronet theater on Geary Blvd. was all it took to get my engines going. But seeing a movie on vacation was deemed foolish by the parents, so I had to settle for a rain check back home. Not, unfortunately, a drive-into-Hollywood promise, but more of a wait-till-it's-nearby deal. So it was going to be quite awhile before I cashed in my voucher. In the meantime, my beloved Baba was anchored in Canoga Park for several months--her first time back since '57--which was grand for me and grueling for my parents. With the attitude if not the bearing (or accessories) of a Romanoff, this long-ago princess of the Russian gentry, once married into Polish aristocracy, now Seventh Avenue seamstress, was resolutely unimpressed by any strides her son was making into the American middle class. Baba subscribed to the inviolable rule that Mother comes first & foremost, which was as comically arrogant as it was self-serving--but luckily, not my problem. I was the pampered grandson; the one who equally saw the foibles and follies of my parents; her ally in judgment. At issue that summer, I later learned, was Baba's disapproval of my father's caged nationality. To the world, and me, he claimed to be from Yugoslavia--a designation rendered neutral in his estimation. And tho we all spoke Russian, it was said to be, like Spanish, a language used across many borders. Starting life in America during the height of the McCarthy Communist witch-hunts could make a nervous refugee paranoid--and in my father it did indeed. Baba, on the other hand, found his caution extreme and bluntly ridiculous. Any evidence of Russian heritage was carefully absent in our newly built habitat--including the language (my first & only tongue to the age of four) which was abolished from even inside the home. Once I entered Kindergarten I never spoke to my parents in Russian again. Baba was appalled at this chameleon act, but father worked in the aerospace industry and was doubly paranoid of being falsely accused of industrial espionage. They also had so little faith in my trust or comprehension that they perpetrated the "Yugoslavian" identity for fear that I would otherwise blab the truth and suddenly we're walking in the footsteps of the Rosenbergs. Concurrent with the heated debate over my cultural upbringing was a little thing brewing called The Cuban Missle Crisis that was hurling us all to the brink of Doom. The extent to which I was sheltered is defined by my virtual ignorance of all that was going on, in spite of the regular "duck & cover" drills at school. Like some nine year old Madwoman of Chaillot-ga Park, I refused to see anything ugly or frightening; aided so dutifully by those around me. And as my guardians were barely literate, musically apathetic, and culturally divorced from any Old Country tropes, I was influenced only by what was being piped into our mid-century suburban sunshine. Things like the new season on TV, with the much heralded return of Lucy (following her unsustainable Bway stint in Wildcat), and Jackie Gleason (after his Tony-winning lark in Take Me Along); legends even in my short lifetime. I'd been weaned on reruns of The Honeymooners and I Love Lucy--a show so universal and ubiquitous in America then; and a hit with immigrants no less, such as Baba, whose explosive laughter, complete with frequent spit-takes, was as funny and entertaining as Lucy herself. New fun was promised in The Jetsons, a reverse Flintstones cartoon; and something called The Beverly Hillbillies, which sounded funny just from the title. But what proved my favorite of all, was an obscure hourlong comedy no one ever recalls titled Fair Exchange, which concerned transatlantic households in a foreign student exchange; and featured Eddie Foy Jr. as the American dad. I believe this show, half set in England, is the genesis of my Anglophilia. Then there were the movies: Flower Drum Song (which I already covered at length); Breakfast at Tiffany's (the world's most elegant party girl in an ultra-modern New York); Lover Come Back, Boy's Night Out, Bachelor in Paradise, Come September, My Geisha, The Notorious Landlady, Jessica. Entertaining stories in exotic or glamorous locales. I was just in 4th grade, but already cultivating, entirely on my own, a taste for the high life. Friday, November 16th was an unseasonably warm day in southern California, with desert breezes and crystal blue skies. At last the day had arrived when The Music Man spread out to local cinemas, and I was finally cashing in on that rain check promised me in July. The Holiday theater on Topanga Canyon Blvd. in Chatsworth was the definition of a "4-wall" in Variety-speak; a rectangular box, parked in a strip-mall with cinder-block interiors and nary a decorative frill. But a church is more than the building that houses it. And that evening the Holiday could've stood for the Vatican. The 7:30 show was nearly sold out when we got there, so we had to split up for seats, Mother and I taking two up front center, Father a single back in the side rear. Despite my long anticipation I was still not familiar with the musical. Little did I know what I was about to see and hear. One of the delights of The Music Man is its specifity. It begins on the morning of July 3, 1912 aboard a train crossing from Illinois into Iowa. (Someone overlooked an obvious detail in the passing landscape. Traveling between the two states can only be done by crossing the Mississippi River. All we see is farmland.) Fourteen salesmen discuss the trade in cadenced language, reflecting the motion of the train, without a note from the orchestra. How's that for an opening? "Rock Island," as the number is called, turned dialogue into a spoken musicality, exempt from melody or rhyme. And tho bursting with references to arcane Americana entirely beyond my nine years (hogshead, cask and demijohn? ), its expositionary purpose comes clearly thru. Harold Hill: his reputation preceeds him. 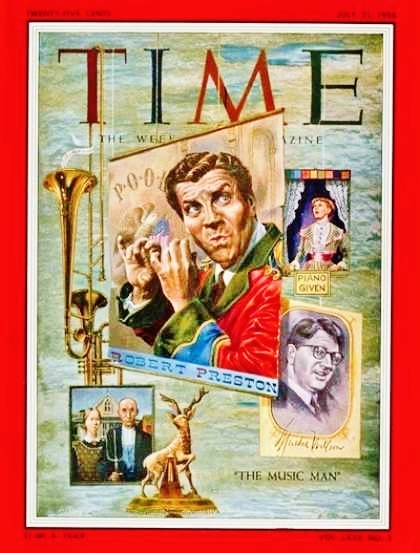 But in Robert Preston's sharply edged profile, we like him already. And when he impulsively hops off the train he takes us into a different sort of Oz; not an Emerald but a River City-- and to my taste all the better for it. 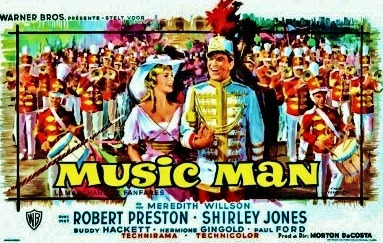 To say that first viewing of The Music Man was among the most memorable nights of my childhood is almost understating it. I can still recall how thrilled I felt as the film broke for intermission; how much I floated on air as we later drove home. By the end of the weekend I had the soundtrack, which only fueled my hunger for the movie, and I managed to see it several more times on screen--a considerable feat at my young age--before it made it to television. But unlike many a youthful obsession, my love and appreciation of The Music Man has never wavered. And so, I must confess, we have come to this: the all-time favorite--and for me literally, all my time, all that I can remember--the one against which all others are measured. Or, as I like to think of it: proof of the existence of God. It was on that Friday night in the Holiday theater that I was born-again. Only my Jesus was a wayward soul named Harold Hill, and my religion was Musical Comedy. And did we have some great hymns! Few shows deserve the possessive credit as surely as this one does, for without Meredith Willson there would be no Music Man. As a valentine to his Iowa boyhood, no cultural reference was deemed too local or obscure. The universal was in its details; the joy in its music. Willson began his musical career at the age of 19, as a flute and piccolo player in John Philip Sousa's band. By 22 he was in the New York Philharmonic under the baton of Toscanini; and before 30, graduated to the position of musical director in Hlwd for the national NBC radio network--later becoming something of a cameo personality on various programs, including Jack Benny's. A much beloved, genial character, he was also an occasional songwriter ("It's Beginning to Look a Lot Like Christmas," "May the Good Lord Bless & Keep You," Glenn Miller's #1 hit, "You & I"), film composer (The Great Dictator, The Little Foxes) and memoirist. It was his book of youthful remembrances, And There I Stood With My Piccolo, published in 1948, that triggered the idea of a musical, encouraged by his pal, Frank Loesser who sensed a show in his Iowa pentimento--and invested in it, too. Willson later recounted the eight-year odyssey getting the play to Bway in another volume, But He Doesn't Know the Territory. (In what can only be justified by continued affection for The Music Man both memoirs were recently reprinted by the University of Minnesota Press.) The show's long gestation gave Willson time to refine his ideas, driving him to experiment with speech and rhythm and untypical song structures. Producers Feuer & Martin, who brought Frank Loesser to Bway and had an unbroken string of hits, first optioned the show, then called The Silver Triangle. But stymied by the libretto, they dropped their option in '55. Much of the problem was Willson's stubborness to include a "spastic" child (presumably one suffering from cerebral palsy--another bit of personal experience?) who remained a puzzle unsolved thru many drafts. The solution came in an epiphany of what made "The Rain in Spain" give audiences goosebumps in My Fair Lady: the exhilaration of a breakthru. There was a similar moment already in Willson's first act closer, "Wells Fargo Wagon," where a young boy (of no consequence anywhere else in the show) bursts thru the crowd to pipe his excitement, with a lisp. The emotional impact was potentially such that it convinced Willson to turn his spastic into the boy with a lisp, and thus Winthrop Paroo was born. Meanwhile, Cy Feuer offered Willson another show they were planning from a novel about present-day Montana Indians that ultimately became Whoop Up--Feuer & Martin's first whopping flop. Meredith stayed his course. Eventually Loesser, again to the rescue, encouraged his Most Happy Fella producer, Kermit Bloomgarden to give Iowa a try. Fella was the first and only musical Bloomgarden had produced by then; having a string of drama triumphs to his credit: Death of a Salesman, The Crucible, The Diary of Anne Frank, to name a few. Concurrently he was producing Look Homeward Angel, that year's Pulitzer Prize winning play, opening just three weeks before The Music Man. Bloomgarden had Willson audition the show for Moss Hart (who came in a mink coat and turned it down flat) But Morton DaCosta saw its potential immediately. Bway's latest shooting star of directors, "Tec" DaCosta broke onto the Main Stem in '55 with his staging of the sleeper hit Amish musical, Plain & Fancy; followed quickly by two more smashes; the comedies, No Time for Sergeants and Auntie Mame. Now this; his biggest hit yet, thus--following in the footsteps of Elia Kazan and Joshua Logan--a ticket to Hlwd, to first direct his stage hit, Auntie Mame for Warner Bros. After winning a Best Picture nomination and coming in as the top grossing film of 1959, Warners had no reason to hire anyone else to helm the film version of The Music Man. Writing a musical is a complex endeavor that virtually demands colla-boration. 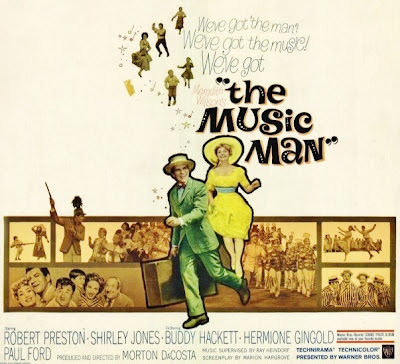 Willson wrote the book, music & lyrics for The Music Man on his own (with assistance on the story from his friend, Franklin Lacey), giving the show a cohesive singularity of voice. Frank Loesser had pulled off the same hat trick on The Most Happy Fella (tho it was built on an existing play), but the practice remains rare, and was virtually unheard of thru-out the Golden Age. I can only discern a few more; Lionel Bart's Oliver!, Noel Coward's Sail Away, Clark Gesner's You're a Good Man, Charlie Brown, and two pastisches: Sandy Wilson's The Boy Friend, and Rick Besoyan's Little Mary Sunshine. Tho most of these were successful, few others dared the solo route. Willson made a second go of it with his adaptation of Miracle on 34th Street in 1963. But Here's Love suffered for it, and he never made it back to Bway. 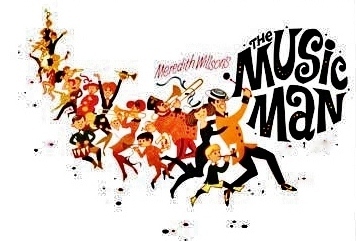 Willson's triumph would forever be his maiden effort but then how could you top The Music Man? Apparently that's how many felt in 1958, kicking West Side Story to the also-ran curb with critics and awards. The two shows opened 12 weeks apart in the fall of '57; a one-two punch that brought the R&H revolution to its very zenith. Those inclined to Shakespearean tragedy over Twainesque humor, remain aghast at the selection of Music Man over WSS by the Tony Awards and the Critics Circle, (much the same as the oft "how could they!" disbelief that Follies lost the Tony to Two Gentlemen of Verona--completely missing the point that Gents was a more successfully cohesive show; and a misunderstood one over time. But that's another story...) To those who know it only peripherally, The Music Man seems like a very old-fashioned slice of corn, with a score from another era; part Sousa, part operetta. But no. In its sly way, The Music Man is every bit as experimental and inventive as West Side Story. Willson also lucked into an element he may not have consciously cultivated: music as the thrust of every motivation. River City is transformed by the embrace of music, whether "real" or imagined--the entire story is about music; its power, its healing, its joy. Whereas West Side is a story told thru music. Beautiful, yes, but not as thematically integrated and clever as The Music Man. The libretto scenes are witty and interesting enuf to suggest the material could stand on its own as a play. But of course the score is one of the grandest delights in the whole Bway canon. As for dance, the show has three big sequences placed at strategic intervals; a perfect trifecta of elements that is the very model of a modern musical comedy. Generally speaking musicals come in two varieties; those that deal with show business in its many forms, thus justifying all manner of musical presentation; or those that are stories set to song, requiring the acceptance of a musicalized reality. For those challenged by such whimsy Willson draws the reluctant in by first giving locomotion to speech; the first "song" is nothing but percussive voices. Thereafter speech turns into song; sales pitches into production numbers; longtime adversaries forge friendship thru vocal harmony; and gossips turn chatter into chorale. Music pours forth from each character, each situation; it's the subject as well as the means to express it. And a metaphor for the God within us all. This ballad, which evokes Sigmund Romberg without sounding dated (the only show tune The Beatles ever recorded--without knowing its origin) is the show's emotional climax and its eleven o'clock number. It could just as well be a hymn. And tho Marian sings her praises to Harold, she's celebrating the message more than the messenger. For when you get down to it, the entire story is about Awakening. And in the end, Harold Hill hears it, too. Robert Preston had made one of the more spectacular musical debuts on Bway, but it wasn't a given he'd be handed the movie. 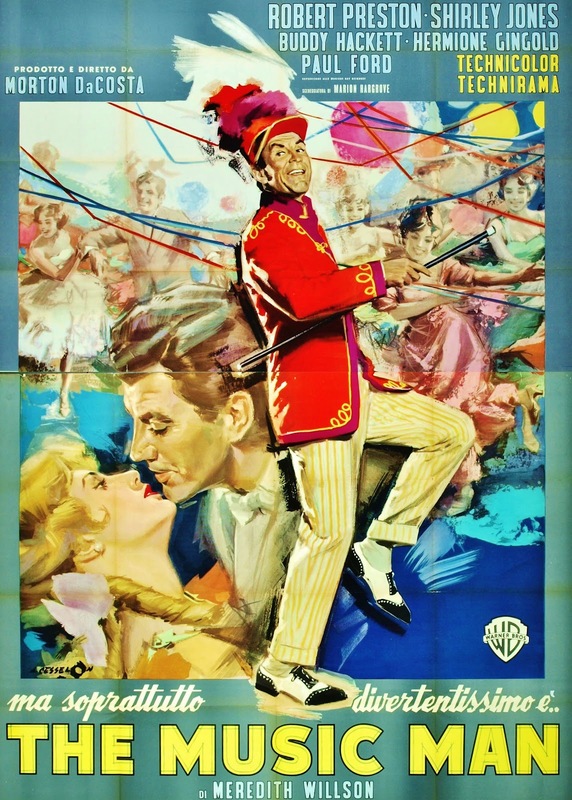 He lucked into the role on stage when Danny Kaye de-clined, tho he was only one of many considered: Dan Dailey, Gene Kelly, Phil Harris, Van Johnson. You can see why Kaye was their model for Harold Hill--aside from his musical experience and his enormous (if somewhat puzzling) popularity; he had a Pied Piper personality (literally in Hans Christian Andersen) that fit the character like a glove--and it would doubtlessly have been a peak in his career. But with Rex Harrison's precedent, the casting floodgates had opened for non-singing actors, which unearthed the less obvious choice of Preston; who, as it turned out, happened to have a fine sense of rhythm and musicality. He got his start in the movies at the age of twenty and spent the next fifteen years as a contract player at Paramount, mostly as a second lead in B-pictures. Gaining little traction he reinvented himself as a stage actor in the early '50s with half a dozen Bway plays to his credit before The Music Man came his way. He was nearly 40 years old and just beginning his career as a star. Nonetheless, Jack Warner pursued Hlwd options in the casting of Hill for the movies: Frank Sinatra, as usual, and Cary Grant were oft mentioned. Grant was said to have scolded Warner to hire Preston, vowing to boycott the picture without him. As it happened Preston was already working on the lot, making his Hlwd comeback in William Inge's Dark at the Top of the Stairs. 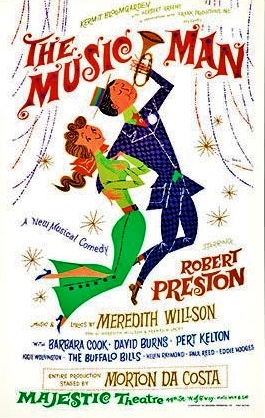 As he had done with Roz Russell, DaCosta revived Preston's career with a Bway hit. His return to the screen was fated. Of course he was best qualified for the role, having played it over 700 times on Bway; yet there is nothing stale about his performance in the film. It remains one of the happiest screen captures of a legendary stage tour de force. The Music Man would also steer Preston's career in a new direction. He made but five films on the strength of his new stardom, then returned to the stage a bona fide Star, headlining another five musicals, including I Do! I Do! and Mack & Mabel, as well as plays such as The Lion in Winter. Then in the '80s there was one last hurrah in Hlwd, in drag no less, as an aging queen in Blake Edwards' Victor/Victoria, opposite Julie Andrews. For this he received the Oscar nod he was robbed of for The Music Man. Some may say Barbara Cook's Marian Paroo was equally iconic; tho her lyrical soprano was hardly the surprise of Preston's song & dance act. She was a star by 1957 but one still in search of a hit. Her stint in Plain & Fancy (under Morton DaCosta's direction) was in a secondary role; her Cunegonde in Bernstein's Candide was short-lived, tho spectacularly preserved on record for generations to come; her Carrie Peppridge at City Center's Carousel was likewise striking but brief. Marian was, at last, her gold-medal role. She was youthful, blonde and lovely, but Cook was also curiously unphotogenic--the camera didn't love her. (You can see it in her appearances on Bell Telephone Hour specials.) So it was neither surprising, nor controversial that Marian would be recast in Hlwd--nor that Shirley Jones would play her. At this point the former R&H ingenue had just won an Oscar playing a whore in Richard Brooks' Elmer Gantry, so her Hlwd profile was as high as her beauty was camera ready. Bway purists and Cook cultists naturally scoff at her replacement by Jones; and while I cherish and respect Barbara Cook as much as the next fan, I couldn't be happier that Shirley Jones is the Marian Paroo I first met and loved. In Dorothy Jeakins period frocks, she is loveliness personified; and I even prefer her voice. After all, it was good enuf for Richard Rodgers. To my nine year old eyes and ears there was no one lovelier. The very first hired for the stage by DaCosta were The Buffalo Bills; a genuine barbershop quartet--which, according to Willson, had never been in any motion picture or Bway show. True Barbershop is unique in that "the pleasure is primarily for the singers; performance for an audience is secondary." The quartet, originally formed in Buffalo, had gained fame winning national competitions, and hearing them on Willson's specialties, "Lida Rose," "Sincere" and "It's You," startles the ear with the purity of their a'capella harmonies. There was little debate about bringing them to Hlwd. But aside from Preston there were only a few other stage repeaters. For the Widow Paroo, Pert Kelton (who some might have remembered as the first Alice Kramden to Gleason's Ralph) was deemed irreplaceable--and rightly so (despite her age as mother of a 26 year-old daughter and a 7 year-old son.) Also from Bway, a couple of townsfolk: Adnia Rice as Alma Hix, and portly Peggy Mondo as Ethel Toffelmier, the pianola girl and squeeze of Marcellus Washburn--tho, curiously, we rarely see any of the townsfolk with their mates; I can't tell you how many times I saw the movie before I put together the Members of the Schoolboard (The Buffalo Bills) are the husbands of the Mrs. Shinn's ladies circle--the genders stick to their own corners for the most part. Only eight actors from Bway--most importantly, Preston--but a whole town full of others to find. Buddy Hackett was an interesting choice for Marcellus Washburn, Harold's old colleague--and the only one to know Hill's real identity. The borscht belt comic seems a good fit as a refugee from Brooklyn; and comports himself with wit and energy thru his big number, "Shipoopi," partnered with his equally corpulent sweetheart. (A major character flaw is his puppy-dog willingness to see his own neighbors cheated and hoodwinked--but Hackett's near-moronic line readings go a long way toward rendering the issue moot.) As Mayor Shinn, Bway comic David Burns, at the age of 55, had finally found himself a hit role (winning a Tony as well); which lead to a streak of hits: Do Re Mi; A Funny Thing Happened on the Way to the Forum (and another Tony); Hello, Dolly! (as Horace Vandergelder). Perhaps Burns was too busy on stage, which drove DaCosta to cast another veteran comic; the bulbous-nosed, always befuddled Paul Ford, who had likewise come into success only in his 50s; first on Bway in Teahouse of the August Moon, then as Phil Silver's foil on the popular Sgt. Bilko sitcom. He's a perfect Mayor Shinn, mangling language left & right, branding his daughter's suitor, "One of them Nithulanians from across town"; mistaking Latin for profanity. He manages to make a curmudgeon and a dolt likeable--and is well matched to his imposing wife. Happily, Ford is only a paper villian next to the vengeful anvil salesman, Charlie Cowell, played a little too forcefully by Harry Hickox. Subtlety isn't his strong suit, and he tends to play every scene to the second balcony. Timmy Everett plays the town's rebel without a cause, Tommy Djilas, with a brawny, yet boyish bravado; and fills his period trousers quite nicely. Zaneeta, his sweetheart and the Shinn's daughter, is played by twinkly-eyed Susan Luckey, who danced Louise's Ballet in the film of Carousel. Together and separately, their dancing rates among the film's greatest musical joys. vividly. (In an interesting coincidence Wickes and my Baba would pass from this earth on the same day in October '95.) Even less utilized is another familiar face: Barbara Pepper, whose greatest fame was still ahead (as Doris Ziffel, Arnold the pig's "mother" on the sitcom Green Acres). Pepper began her film career as a Goldwyn Girl in Eddie Cantor's Roman Scandals, alongside Lucille Ball--who remained her friend for life; later casting her in bits for I Love Lucy. A dame in the Joan Blondell style, Pepper found steady work thru the '40s until her husband's accidental death drove her to depression and alchoholism. Now weathered and dumpy she took what roles came her way. Here she has but one line in a brief scene with Preston (recruiting her tone-deaf twins in the band), tho she's frequently seen everywhere as part of the ensemble. Shockingly, Pepper was only 54 when she died of a heart failure in 1969. As delightful as all those mentioned above, no one steals the show like the incomparable Hermione Gingold. From the moment I first laid eyes on her Eulalie Mackechnie Shinn, I was enthralled by the uncanny resemblence to my beloved Baba, in both comportment and voice--down to the Slavic into-nations. It was as if Gingold had studied Baba for this role; so spot on were the raging looks; the stamp of defiance; the flirtatious croon. The scene leading into "Pick-a-Litttle," is transfixing for Gingold's incomparable line-readings, "Oh, yesss, I am reticent! "; "I cannot say, no I cannot say, at this time! "; her single-word condemnation, "Balzac!" uncoiled in basso-profundo. Then there's her cultural pretensions: recitals danced with middle-aged housewives of River City: "Grecian Urns," "Heeawatha;" assuming a singing Statue of Liberty, howling "Columbia, the Gem of the Ocean" magnificently off-key. It's an Oscar worthy performance; sadly overlooked by the Academy, tho she did receive a Golden Globe nomination--losing to Angela Lansbury's monster mother in Manchurian Candidate. (The Oscar went to Patty Duke's Helen Keller.) So iconic was the impression Gingold made upon me, it is somewhat shocking to realize her imprint on American culture was rather tenuous. She's primarily cited for her Mamita in Gigi. She was also a convincing witch in Bell, Book & Candle, and a frequent guest on the Jack Paar & Johnny Carson shows. But Eulalie Shinn is by far her finest hour and signature creation. In the end DaCosta did a remarkable job of casting--tall & short, fat & thin, rosy-cheeked and stern-browed; it's as if Fellini cast his eye upon the cornbelt. (And tho it's ethnically deficient, it doesn't feel remotely inaccurate for the time and place, unlike the lily-white Times Square in Guys and Dolls.) Many scenes sweep across the faces in the crowd; we see so many extras again & again we feel like they're our neighbors by now. Following State Fair and Pajama Game, The Music Man was the third Iowa-themed musical in a dozen years--smash hits, all of them. Sorta makes you wonder if Iowa exerts some lucky charm (any takers for a musical Field of Dreams?) There's something about those Hawkeyes. complain about a book of Persian poetry recom-mended to Zanetta, "This Ruby-hat of Omar Khay-ay-ay-I am appalled!," she protests, condemning it (and much else in the library) as "smutty literature." "People lying about in the woods eating sandwiches!" she rails with as much outrage as if they were fornicating. It's a hilarious summation of small-minded Babbittry that deftly establishes the conflict Marian faces from the community, and defines Eulalie as a formidable and comic character. Thru-out Mr. Hargrove fills out the edges of scenes, while maintaining near perfect fidelity to the stage original. In the show, "Iowa Stubborn" immediately follows the opening train scene. On screen Hill makes his way into town getting a taste of the local attitude. In answer to his query for a good hotel, he's told to "try the Palmer House in Chicago." What do folks do here for excitement? "Mind our business," and then as the nosy crowd gathers they begin "Iowa Stubborn." Actually we've been hearing the song--as underscoring--since Hill got off that train; it's a jaunty tune, like a morning stroll, and the instrumental lead-in is one long seduction into the song--which gets most of the town chirping as a chorus. By evening shade it's Hill's turn: his pitch for a tempest. A pool table in town! "Either you are closing your eyes to a situation you do not wish to acknowledge..." Another rhyme-less song, a flowing stream of consciousness, told rat-a-tat style, that anticipates rapping by decades, and despite its arcane vernacular, is a (now) familiar American classic: "Trouble." Directly following that tour de force, the underscoring introduces Marian's Theme, a haunting melody not from the Bway score--as the librarian makes her way home, accosted by Hill. Tho she rebuffs him, she's intrigued enuf to have a discussion with her mother, while piano student, Amaryllis, works her scales. It's yet another conversation-in-song, concluding with this tongue-twisting coda from Mom: "I know all about your standards and if you don't mind my sayin' so, there's not a man alive who could hope to measure up to that blend a' Paul Bunyan, Saint Pat and Noah Webster, you've concocted for yourself outa your Irish imagination, your Iowa stubborness and your liberry fulla books." What kind of lyrics are these? Sure a far cry from "Tea for Two"--a song written a dozen years after Music Man takes place. Winthrop, and his unhappy condition are introduced, and then Amaryllis touches off the feeling of longing in Marian, too. Tho "Goodnight My Someone" is a lovely, elegiac song in its own right, it's really a slowed-down version of "76 Trombones"--yet it sounds so different, many might not make the connection until both are reprised together at the eleventh hour. The song neatly concludes the film's first section; with DaCosta reprising the technique from his Auntie Mame film: ending acts with an iris zeroing in like a spotlight. The 4th of July ceremonies at the Madison gymnasium next morning are like scenes from a period Waiting for Guffman. When a commontion ensues, Hill steps in and makes a dazzling pitch for a marching band with "76 Trombones," that hypnotizes the entire town--except, of course, Marian. It mesmerizes us, too--Preston's dash and enthusiasm reflected off the eager faces of townsfolk, who after one verse--with another set of clever lyrics--are jumping off the bleachers to beat the band. Here's the first of choreographer Onna White's big production numbers--a specialty developed by the former assistant to Michael Kidd, beginning with this her first stage musical. It's an exuberant display that builds to a frenzy of excitement with men flying in on ropes, and dropping from the ceiling on trapeze bars. Onstage the number was confined to the gym, but the movie allows the "band" to head for the streets and march thru the town. What makes it all that much more stirring is the quality of Willson's composition--It's one thing to write a march for a musical; Frank Loesser wrote a nifty one for his first show, Where's Charley ("The New Ashmolean Marching Society...")--but it's something else to compose one that stands alongside the greatest by Sousa: "El Capitan," "The Washington Post," "The Thunderer." "76 Trombones" is in a league of its own among Bway show marches, and of course more than any other song it's the show's musical signature. Unfortunately we are not privy to the "Last Days of Pompeii" spectacle at Madison Park that evening. (We can only imagine Eulalie's role) But of course that would only distract from the necessary and crucial business at hand: Prof. Hill's spontaneous construction of a stellar barbershop quartet out of longtime adversaries--who, from now on, will be inseparable harmonists. Fireworks grace the final notes of their first ever performance: "How can there be any sin in sincere..." a ditty that sounds like a genuine popular tune from the turn of the century. By the time we get to "Pick-a-Little, Talk-a-Little" and "The Sadder But Wiser Girl," we've been so consistently dazzled by the cleverness and diversity of the music and the lyrics that we recognize the possibility there isn't going to be a single dud in the score. (There isn't--and how rare is that?) Now Hill goes to make his sale with the librarian. So, what sort of dance do you do in a library? Why, a soft shoe, of course. Here's Onna White's second showpiece in the movie--and another athletic use of a building: the double decker, wrought-iron jewelbox set for "Marian the Librarian"--a tad elaborate, perhaps, for a town of this size, but then books, in those pre-radio days were such a dominant part of cultural life, the library was akin to a temple. Cinematographer Robert Burks has the camera move thru the building with a grace befitting the melody. (Burks was Hitchock's favorite cameraman, used all thru his 50s Technicolor period. He won his Oscar for the suave Riviera moods in To Catch a Thief. ) The soft shoe ballet that follows Preston's verse is sheer delight; and with the music building to a crescendo, the camera pulling back to reveal the entire building kicking up its heels, it's electrifying. Now Marian gets swept up in the tide of dancers, hurling her glasses off in giddy abandon. I know how she feels. Still, it's only a momentary lapse, she's soon back to her skeptical nature, confessing her desires in a ballad. The longstanding rumor that "My White Knight" was really composed by Frank Loesser, is given some credence by Willson's rewrite for the film, "Being in Love," which has a sweeter refrain, while maintaining the long middle section ("All I want is a quiet man..."). I've always felt "Knight" a thorn on the OCR (it sounds like a first draft for what became Sarah Brown's "I'll Know" in Guys & Dolls). It has Loesser's distinctive dissonance; a turgid melodic line--hum the first bars, "My white knight, not a Lancelot or an angel with wings..." and imagine that used ad infinitum as Marian's theme. In the film, "Being in Love" is heard as underscoring until late in the first act, when Marian finally gives words to a theme we've heard many times over. It's a sweet melody that works in various moods and tempi, and another improvement on the original source. ("Knight" was also intended to be reprised in counterpoint to "Sadder But Wiser Girl"--a technical match-up, perhaps, but not a musically graceful one) As far as Marian's wanting song goes, Loesser's is lesser. The arrival of the "Wells Fargo Wagon" brings the first act to a rousing finish as Harold Hill triumphs over one and all; even the reluctant librarian has succumbed now that Winthrop has come out of his shell. It's an unusual act break; ending not in accelerating conflict (as is typical), but in the resolution of all conflicts (for the time being, I'll grant you). The movie hasn't got an official intermission, but theaters would use the obvious act break (and iris-out) to stop the film and sell some popcorn--even in Canoga Park. The pic ran a solid two and half hours and feeling as rich a meal as a Bway show, an intermission is a good thing. It's enuf to bring me back to earth for some oxygen, before re-entering Planet Iowa. The second act continues in carefree bliss for a good while. Several weeks later River City is brimming with music and life. Eulalie and her Ladies Eurythmic Dance group rehearse "Grecian Urns"; the School Board members croon "Lida Rose;" Marcellus calls the kids to "Shipoopi"; Winthrop reprises Harold's vaudeville turn, "Gary, Indiana," and Marian wonders "Will I Ever Tell You," as she confesses feelings of love, if only to herself. Conflict returns in the form of anvil salesman, Charlie Cowell, ready to burst Hill's bubble; publically denouncing him, turning the town into an angry mob and setting off a chase for the culprit--complete with flaming torches. Along the way there are some emotionally gripping scenes: Marian's attempt to thwart Cowell and instead getting an earful on Hill's exploits; Harold's persuasive defense mining Marian's own experience with rumors; her confessions at the footbridge--all textbook examples of succinct libretto writing; scenes that compel us, are more than just the path to the next song but genuine pleasures in themselves. When chaos explodes DaCosta has fun with the scrambling townsfolk, filling each frame with bits of amusing action--accomapanied by some lively scoring of the musical's various themes at gallop speed. In the eye of this storm stand Harold and Marian on the threshold of their future. If there is a single scene in all of cinema that can draw tears out of me, each and every time, this is it. If I'm not already blubbering by the time Winthrop--all tears himself--says to Harold: "I whith you'd never come to River Thity," that does it for sure. And when Marian reminds him of the miracles Harold has performed--even if unintentionally or unknowingly--I'm likely to be sobbing. But this is new territory for Hill, too. The salesman finally got his foot caught in the door. And how could he not? Here's one babe who loves him so much, she releases him--and of course, that is what holds him. "...No I never heard it all/Till there was you." Then, with their climactic clinch, the mob descends upon them, dragging Hill off to seal his doom; leaving Winthrop, Marian and Mama bereft on their doorstep--and me in a cathartic puddle. If you're new to the story, it isn't easy to guess how he'll get out of this one. It's Marian who pleads the case for him in the makeshift courtroom assembled at the high school. (Yet another musical ending in some form of court to sort out the plot.) But Shinn brushes her aside, demanding those in Hill's defense to stand up. And upon consideration, they do--one by one, until Eulalie refuses to be the lone holdout. Shinn commands she sit. She plops. But the look on her puss as she stomps back up in defiance is priceless. Then Shinn shouts those fateful three words, (which now, even in anticipation of them, can reduce me to a snarling, raving, panting jungle beast!--well, wrong show, but you get the idea) "Where's--the--band?" And here it is, at last: that boy's band, all in uniform with shiny gold braids and new instruments having their first run at the Minuet in G. (Has anyone ever noted how odd a choice Beethoven's Minuet in G is for a marching band?) It doesn't matter if they're lousy, they're playing--it's enuf to validate Hill's promises and make him a hero. In the religion of musical comedy Jesus is spared the cross. For an encore the town morphs into that ultimate fantasy marching band, making manifest those "76 Trombones." It's the fantasy gone "real," the station this train has been heading for all along; a true climax. Few musicals top themselves in the finale. DaCosta uses this reprise parade to identify the cast; a curtain call, if you will--which takes nothing away from the number, but deepens our awareness of all the many characters we've met. The final crane shot as Harold and Marian lead the parade down the Main Street of our dreams couldn't be more satisfying. What other original character from a Bway musical has become a fixture of American folklore? Shorthand for the consummate flim-flam artist, "Harold Hill" is an archetype that remains in common usage half a century later. He's an opportunist, a crook and a liar--as well as charming and likeable. The gospel he preaches is self-serving, yet the postive reinforcement he so casually dispels works miracles of transformation. It's the Power of Positive Thinking as fable. Of course it is Hill's own redemption that allows us to forgive his previous transgressions--his sins washed away by the power of love. As with Jesus, the journey is to bring us closer to God. God, defined here (and rightly so) as the mysterious, metaphysical and transformative power of music. And this savior: a man of music, a Music Man. (A truly great title, by the way, despite its generic simplicity--made all the better by a show that delivers on its promise.) Because of Hill, the musical has a distinct appeal to men of all inclinations--particularly those not usually in thrall with musicals. My straight college buddies were as keen for it as I, and there are those like Conan O'Brien who wrote a loving parody episode of The Simpsons, and performed "Trouble" as host of an Emmy Awards. Seth McFarlane has referenced it at least twice in Family Guy, including an episode where Peter Griffin does the entire "Shipoopi" number (animating Onna White's film choreography) in a football stadium. And what are the odds that my other favorite movie, The Apartment, not only cites the show as the default Bway ticket for entertaining out-of-town clients, but has an actual scene with Jack Lemmon waiting futilely outside the Majestic Theater for Shirley MacLaine? As recently as 2006, Jeff Goldblum starred in a mockumentary as Hill in a regional producion in Pittsburgh. Like Huckleberry Finn, Jay Gatsby and Atticus Finch, Harold Hill continues to resonate as a a beloved character in American folklore. New productions of the show will continue to be mounted. There was even a remake of the movie (for television) broadcast on ABC in February 2003. Miscast on nearly every front: milquetoast Matthew Broderick as Hill, a firecracker Kristen Chenoweth as Marian, Victor Garber as Shinn, Molly Shannon as Eulalie; helmed by a director of TV cop shows, the film was a total embarrassment. Given the parameters of this project, it should be part of this discussion. But you'll forgive me if I cannot bear to ever lay my eyes upon it again. Remakes should only be attempted if something wasn't perfected the first time out. It's hard to say if the movie would've had the same impact on me if set in a different period, in a different style. Walt Disney had already spoiled me forever with his Victorian--set Main Street. River City is in the same mold as that village gateway to Disneyland--a trigger of adrenalin to my imagination since my first visit at the age of four. By nine I was a veteran guest, thus discovering my favorite place on earth transposed onto a musical was pure rapture--they "had" me at the train depot. Much more than the stage show, the movie gives us an entire town in period detail. The theater set-pieces are greatly expanded; the gymnasium, the double-decker library; the town square, the footbridge--each a beautiful postcard. Perhaps because we spend so much screen time at the house of Paroo, it is rendered with so much care--and, presumbably, authenticity. We visit it from various angles: the front, the back and inside the parlor and kitchen. It's something of an architectural marvel. Notice the view from the parlor at Marian's arrival. The room itself looks long and narrow, but at the end is a staircase that forks after a few steps, into a V-shaped angle. Similarly, the kitchen shifts halfway thru at a 45-degree curve. It makes an intriguing, if implausible. structure--and one whose details I never tire of cataloging--but I doubt a simple Iowa cottage would have such creative design. The facade and street front is also a marvel of detail, from the porch thru the yard to the sidewalk, the neigboring homes and those down the block. This lavish soundstage set used entirely for night scenes, casts a glow of seductive nostalgia--even for those without personal memories. Veteran art director Paul Groesse got his 8th Oscar nod for the movie, and would've deservedly and easily won but for a little something called Lawrence of Arabia. Set decorator George James Hopkins, also getting his 8th nod from Oscar, was old enuf to recall the period from personal experience--he was seventeen in 1912. Costumer Dorothy Jeakins, whose sole previous film musical was the antithetical South Pacific, outfits the cast in eye-popping cornbelt couture. The millinery work is especially exquisite. Marian and Eulalie wear stunning "everyday" gowns (amazing how fresh everyone looks so fully dressed in the middle of a Midwest summer--not a single barefoot boy in sight) We have to marvel as well at the wardrobe Hill pulls out of that small valise he arrives in town with. The loss of Jeakins' Oscar to (the now entirely forgotten) Wonderful World of the Bros. Grimm is far less excusable. Given the care Warners lavished on the film, the hefty price paid for the rights, and the recent precedent-setting success of its sister show, West Side Story, it remains a real puzzle why The Music Man wasn't released with more bells & whistles. Yes, there was a bang-beat world premiere in Willson's home town of Mason City on June 19th, complete with all the film's stars. But no reserved-seat Roadshow engagements followed in NY or LA. The movie spread slowly outward from Iowa. as tho Warners hadn't any confidence in the cultural cognescenti, and wanted to get ahead of it in more "surefire" markets like those in mid-America. It opened in San Francisco on July 11th--two weeks before its Hlwd premiere. July 25th was also likely the original target date for its booking at Radio City. But after five weeks, the Cary Grant/Doris Day comedy, That Touch of Mink was still minting money--and held over, again. And again. Until ten weeks passed, breaking the Music Hall's previous summer's nine-week record run of Fanny, and pushing Music Man's opening to late August, at least a month later than originally planned. While West Side Story continued in exclusive runs thru-out the country all thru the year, Music Man hit the country wide in late summer and dominated till Christmas. Profit-wise it was the #5 film of the year--topped only by West Side Story, Spartacus (in wide release), and two Doris Day comedies--with $8,000,000 in rentals. Not quite the blockbuster grosses of West Side Story, which begs the question of whether a Roadshow release would have built up even greater interest. But if Warners bungled the release strategy, they mastered the scale of the product itself. Hlwd's respect and hunger for Bway musicals had shifted so dramatically in the last dozen years that it virtually drove the original screen musical into extinction; elevated Bway credentials to a de facto badge of honor; and lifted budgets, marketing, and running lengths to new highs. The Music Man found the perfect balance of size: a full-scale Bway hit done large but without excess; teeming yet intimate; lengthy yet concise. (Sadly this example was soon forgotten, as the age of bloat takes hold in Hlwd's romance with the Bway musical.) In the end Hlwd embraced the film as much as the rest of the nation. The pic received 6 Oscar nominations, but most importantly one for Best Picture (along with The Longest Day, Mutiny on the Bounty, To Kill a Mockingbird, and inevitable winner, Lawrence of Arabia)--only the third Bway musical ever to do so. Now, thanks to West Side Story, the genre was elevated to a prominence and popularity never seen before or since. Surely Preston must've just missed the cut for Best Actor; and I'd like to think that Gingold was in the running for supporting actress. Morton DaCosta received a nomination as the film's producer; but he never got a Director nod even tho two of his three films were Best Pic nominees. (His final movie, Island of Love, was a middling comedy, with Robert Preston running around Greece.) The film's sole Oscar win deservedly went to Ray Heindorf for his musical scoring. The film's soundtrack album charted 56 weeks, reaching #2 for six of them. 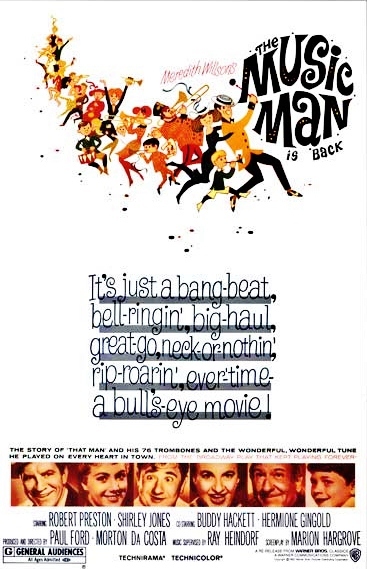 But unlike West Side Story, buyers preferred the Music Man OCR, which was the #1 album for 3 months in 1958, and was still charting all thru 1962, for a total of 245 weeks. I, naturally, preferred the soundtrack. And I find it quite disappointing that Warners hasn't yet released a fully re-mastered version, complete with all the blissful underscroing. Could somebody please get on this! We've all heard of fanatics who claim to have seen Star Wars or The Sound of Music many hundreds of times--more hyperbole than reality, one would hope (Get a Life!). For me, The Music Man has merited more repeat viewings than any other movie. Over fifty years I've enjoyed 30 visits--in all forms: in theatres, as special events, on B&W TV, on video, on DVD; as a wide-eyed child or an aging adult; stoned or cold stone sober; tripping on LSD or as balm for a broken heart. It was a private annual ritual for many years--invariably in summer (Is it any wonder that Independence Day is my favorite holiday by a mile?) The Music Man will always be the chicken soup for my soul. In a marvelous bit of symmerty this will be the story's centennial summer. To my 1962 eyes, the world of 1912 was as ancient as the Civil War or the French Revolution. Another fifty years have passed now since those "modern" days imprinted my consciousness--can it be that today's nine year old looks at the 1962-set Hairspray or Mad Men with the same incomprehensible distance those horse & buggy days looked to me back in 1962? We didn't know it then; that these were the waning last days of our still "innocent" Post-War America. For all intensive purposes I was still the son of "Yugoslavian" parents; those diabolical Soviets had backed off Cuba; Baba was back in NY; Lucy was back on TV and all seemed right in the world. Without any cultural examples set forth by my parents, I found my own in the immediate world around me. Canoga Park was a bastion of Iowa transplants. The Music Man gave me a heritage--and an American identity--I could well embrace. Thru the stages of my life, I've lived the emotions of these many River City-zians. At age nine I was Winthrop, natch; then a teenage Tommy Djilas, bursting with energy and rebellion; by 25 the ambition and focus of Harold Hill was most relatable; then later the mellowing nature of Marcellus; not to mention those moments when Eulalie might peek thru, or the emotional roller coaster of my love life that would feed off (and heal thru) Marian's heartbreak and resurrection. These were my people as if they were family--perhaps in lieu of family. In Field of Dreams, Ray Liotta wanders in from the corn (with stalks as high as an elephant's eye) and asks if he's in heaven. "No," says Kevin Costner, "Iowa." I know how he feels. The Music Man (and The Pajama Game and State Fair) may not be heaven; they may not even be Iowa--more an Iowa of the Mind. An Iowa that looks and feels a lot more like California; where small towns look a lot like Disneyland. I laughed, I cried, I feasted on Rahadlakum--and I still thrill to the sound of 76 Trombones--who could ask for anything more? New Songs: 1: "Being in Love"
Standout Numbers: “Marian the Librarian"